Michelle Lyu, a senior at Diamond Bar High School, plans to study chemistry at the University of Pennsylvania with the help of the $40,000 Edison Scholars award she received. Michelle Lyu (left) and Athena Chen, both seniors at Diamond Bar High School, celebrate their selection as 2015 Edison Scholars at a reception at Edison International headquarters in Rosemead. SCE President Pedro Pizarro praises students for their decision to pursue Science, Technology, Engineering or Math (STEM) studies during a recent Edison Scholars reception. The 2015 Edison Scholars during a reception held in their honor at Edison International headquarters. 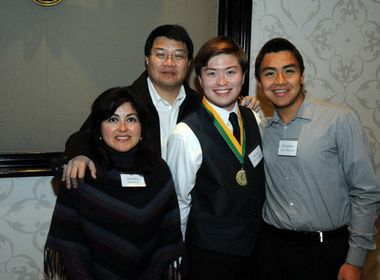 Classmates Michelle Lyu and Athena Chen recently received the coveted $40,000 Edison Scholars award. Michelle Lyu thought it was a little weird when she ran into her father in the parking lot of Diamond Bar High School on a school day. It all became apparent later when her father and a group of people the high school senior didn’t know came into her yearbook class to present her with a $40,000 college scholarship. It was only then that Michelle realized Diamond Bar was one of only three schools in Southern California to have more than one Edison Scholar. Silverado High School in Victorville also had two Edison Scholars and Porterville High School had three. Unlike Michelle, Athena did not get a surprise announcement in class, but rather learned the news while studying at home. Athena was Skyping with an online study friend when her mother interrupted her to hand her a letter from Edison International, parent company of Southern California Edison. It was only after Athena read the letter several times that she realized she, too, had won one of the coveted scholarships. 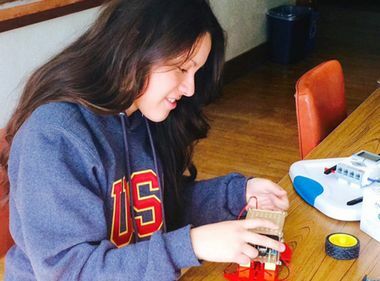 Edison International created the scholarships to help minority, low-income and underrepresented students in Southern California who plan to major in science, technology, engineering or math (STEM). Only 30 were selected from the nearly 2,800 students who applied. Michelle plans to study chemistry at the University of Pennsylvania and ultimately go into research. “I anticipate conducting cutting-edge research in a lifetime of science,” she said. Athena won an early entrance to Northwestern University near Chicago where she will major in mathematical methods and social sciences. She hopes to become a technical consultant at a nonprofit helping the disabled. The two girls were among the 2015 Edison Scholars recognized at a recent reception at SCE headquarters in Rosemead. SCE President Pedro Pizarro praised the students for choosing to major in STEM studies, noting how rewarding his own education in the sciences had been. 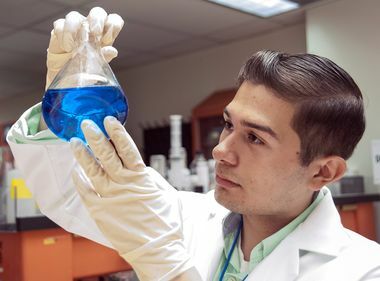 He started college at Harvard as a pre-med major, but switched to chemistry. He later earned a PhD in chemistry at Caltech. “My science background really opened up doors,” Pizarro said. Michelle has similar hopes for her future. She was inspired to pursue chemistry by her father who has suffered from Hepatitis B since birth. His medication costs up to $6,000 a year, which became a major burden for the family after her father lost his job in 2010 and was unemployed for most of the next three years. Winning the scholarship convinced Michelle she is on the right course. “Believe in your dreams and just go for it,” she said.